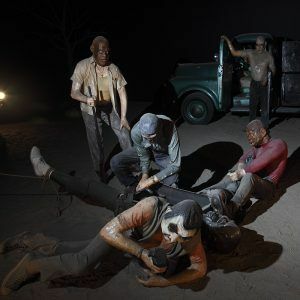 Home › Events › Race & Whiteness – Frederick the Great to Ed Kienholz. Race & Whiteness – Frederick the Great to Ed Kienholz. “My own research (image: tree) conducted between 2000 and 2006, looked specifically at the history of lynching, but in California. The research resulted in the publication of my book Lynching in the West: 1850-1935 (Duke, 2006) and two related art projects. The first was the Erased Lynching series in which I digitally removed both the bodies and the ropes of those lynching in California, to direct viewers to our own missing history, and to the invisibility of Latinos, native Americans and Chinese within popular conceptions of the American West. The second series, entitled Searching for California Hang Trees, served as a visual record of my own journey to go and search for all of the sites uncovered in the research. An impossible task but one which sought to destabilize my own role, as either author, artist or subject. In the interest of time, and since I have spoken on this subject before..let me just show you a few more images before moving onto the new project. My book documented, for the first time, over 350 cases of lynching in California. Of that list, only eight cases involved the lynching of African American Men. In California, over 40 percent of the cases involved the lynching of Latino men, and one woman, which when combined with the lynching of Native Americans, Chinese, and blacks constitute nearly 2/3rds of the entire case list. A ratio that is paralleled in the national statistics on lynching which recorded that nearly 2/3rds of all cases in the NAACP case list involved the lynching of black men and women. ‹ LACMA Unframed w Ken Gonzales-Day.